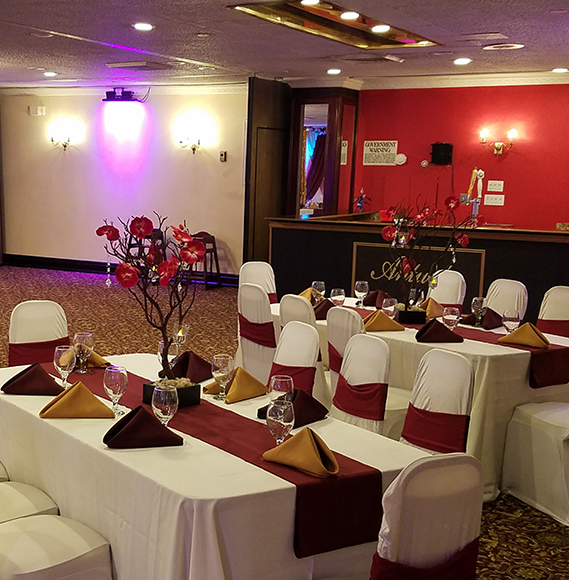 If you or your business is hosting an upcoming corporate event, look no further than Antuns by Minar. We have a variety of catering options as well as rooms to choose from for your event. Contact us to meet with one of our event planners and ensure that you are getting precisely what you want when it comes to the look and feel of your event. Wow your clients as well as your business partners when they step into our dramatic lobby and walk up our exquisite entrance staircase. Our professionals can style the room of your choice to your specific requirements. Choose from our different rooms including our Ballroom Suite with seating up to 250 Guests or the Hamilton Paget Room which is suitable for up to 400 Guests. Planning your event last minute? No problem. We have over thirty years of experience getting some of the most unforgettable events off the ground with very little planning time. We are fully equipped to create an event with you that will suit your specific needs perfectly.